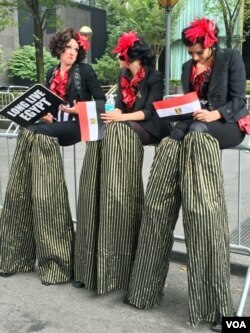 The women towered over the crowd near the United Nations in New York, wearing the colors of the Egyptian flag -- big red bows on their hair and waists, over black and white striped leotards. Black and gold striped trousers covered the stilts that raised them up. They were just several of the thousands of people demonstrating for or against various governments, a city block away from where the leaders of many of those governments were addressing the UN- during the annual General Assembly. Women on stilts cheer for Egyptian President Abdel Fattah el-Sissi (VOA photo - C. Presutti). Amira Abdelhamid said Egyptian President Abdel Fattah el-Sissi is fighting terrorism in Egypt and around the Middle East. "We need the military right now. We need someone with power to get our land stabilized. We need peace and calm right now." An opposing voice came from Moustafa Mohammed, who argued against al-Sissi from the other side of a thick steel police fence. "This man robbed Egypt of power through a military coup two years ago. The United Nations did nothing about it. Mr. Obama did nothing about it. He should not be welcome in the U.N. to speak on behalf of the Egyptian people," Mohammed said. The largest group of protesters paraded an oversized caricature of Iran's President Hassan Rouhani, as a puppet, accusing him of executing 2,000 people since taking office two years ago. Delaram Ahmady's family left Iran when she was four-years-old. "The United Nations is a place where countries come together to discuss the future of the world, a better place for children and young people to grow up in. It's not a place for Hassan Rouhani and his regime to be given a platform. Countries inside are discussing animal rights and climate change right now. Not brutally killing people. We are into 2015, but the cutting off of someone's hand? As a society, we need to get past that," she said. About 10 protesters wore light blue rain ponchos - the color of the United Nations - and walked backwards three kilometers to protest the nuclear agreement between Iran and six world powers. Mookie Tenembaum was the artistic creator of the backwards march. "Iran executes people, not agreements. The Iranians have hacked our values. They have hacked the free world," he said. 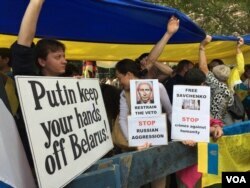 General protest against Russian President Vladimir Putin (VOA photo - C. Presutti). Slava Kolomiets came to the United States 10 years ago. She wore a bright flower garland in her hair, the traditional dress of her homeland Ukraine. She was protesting Russia's invasion of her country -- and blamed Russian President Vladimir Putin. "Don't kill our children. Go home. Putin, go to Russia. Stop the war in Ukraine," she said. Some protest voices were heard through silence. Falun Gong used its meditation exercises as a protest against the Chinese government.